Studio monitors are high-quality speakers that are designed to deliver precision. When you’re recording sound, a studio monitor is a vital piece of equipment to use in order to ensure that what you are recording sounds the way you think it does. No matter how expensive your speakers are, low-end and high-end frequencies will be boosted slightly to give the user a more pleasant listening experience. If you’re producing music, you need to be able to listen to all of the different musical elements in their purest form to guarantee that the mix is put together correctly. Let’s have a closer look at studio monitor uses, including how and why they differ from speakers, as well as what types you will have to choose from should you end up purchasing one. A studio monitor is basically a loudspeaker housed within a speaker box or enclosure. It gives a more accurate reproduction of what is being recorded or played as it is designed to produce linear phase and frequency responses. This type of speaker is also called “uncolored” or “transparent”. This reflects the sound it gives, which represents the source audio in its purest form. On the other hand, a speaker is designed to produce a “colored” sound. What does this mean? This means that the speaker emphasizes certain frequencies. It will often boost both high- and low-end frequencies to give a “smiley-face” frequency curve. This will make the music sound more powerful, which ultimately results in a better listening experience. Your home entertainment system may also offer you the option to change the bass output yourself. This is a feature you wouldn’t see on a studio monitor, or want to see, as it’s designed to produce as little alteration as possible. A studio monitor will be built much more robustly. The housing will be far more sturdy and as nonresonant as possible to avoid “coloring” the output. The speaker cones will also be much more robust than a conventional speaker. This is to withstand pressures from the studio environment such as loud drums and electric guitar solos. The strong speaker cones will also be better suited to cope with the fact that a producer may be working on bass sounds for straight hours. This means that the equipment needs to be able to withstand long periods of low-frequency sound production. The majority of studio monitors on the market these days are “active”. You can tell just by looking at a monitor whether it’s active or passive because an active monitor will have a mains input. Passive (unpowered) monitors require an external amplifier and crossover, which you should match to your studio monitor’s specifications. If you already have your own amplifier in your studio, then buying passive monitors may save you some money. Active (powered) monitors have their own built-in amplifiers. This means you will have fewer pieces of equipment to find space for and carry around. Plus, there’s less work in finding an amp that matches up perfectly to your monitor’s specs. 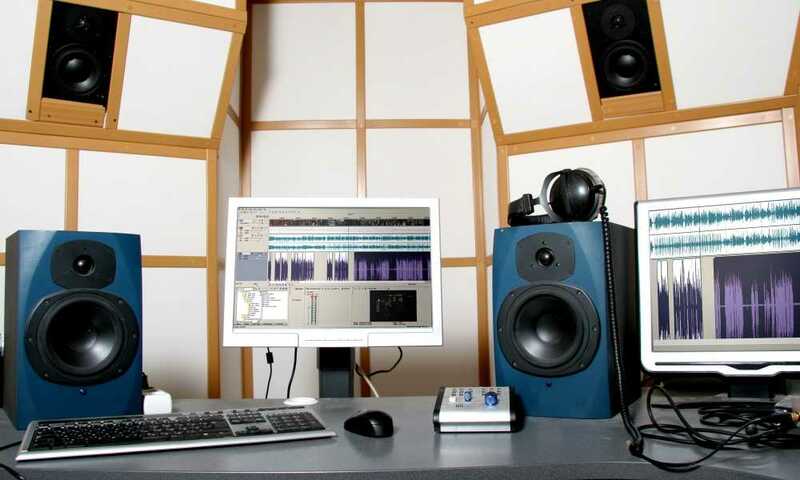 Far-field monitors are best suited for professional recording studios that have special walls designed for acoustics. They are usually larger and have the ability to cope with much louder volumes. On the other hand, near-field monitors are ideally suited to home studios because they are designed to be placed nearer to you (around one or two meters away) and pointing directly at you. This is so that the sound isn’t distorted in any way due to bouncing off the walls, ceiling, and the likes. You need to make sure that the studio monitors you invest in can handle the frequencies that you are (or will be) working at. For most recording work, a range of around 50Hz to 20kHz is more than adequate. If your projects are going to be relying heavily on a lot of basses, however, then you may want to look at monitors that start with a lower number than 50Hz. In fact, you may even need to invest in a subwoofer to widen the lower frequency range. Not only do you need to check the frequency range but you also need to make sure that the monitor can output these frequencies evenly. This is measured by a further number in decibels (dB). A monitor that reads 50Hz to 20kHz +/- 2dB means that some of the frequencies you are hearing may be up to 2dB louder or softer than what is actually recorded. A rating of up to +/- 3dB would be considered good enough for most applications in a home studio. Shown in the form of wattage, the higher the power your studio monitors have, the greater the volume they will play at. Plus, more watts will also produce better definition and dynamic range. Music peaks, such as snare and kick drums, can require up to 10 times the power than your other material. This explains why many speakers suffer from distortion when playing high frequencies such as these. Do You Need a Studio Monitor? Whether you’re recording or mixing sounds together, it would be extremely wise to invest in a studio monitor to ensure that you get the best results for your production. Studio monitor uses are invaluable when recording any type of audio. Hearing the sounds that you are producing in its purest form will not only help you to fine-tune your audio track but also make sure that it plays well on any type of speaker in the future. This is one of the many reasons why you need to invest in a studio monitor. As with most things in life, the more you invest, the better your studio monitor will be. There are, however, a good range of monitors on the market that are very reasonably priced. Thus, if you are investing in a home studio, then you should be able to find adequate monitors starting at just a couple of hundred dollars. For convenience, check that the studio monitor you are buying is “active” (unless you already have an amplifier you wish to continue using). Also, remember that near-field monitors are better suited to for smaller rooms that lack acoustic wall covering.